Home » Uncategorized » Buy KAZ Minerals #KAZ says VectorVest. Current valuation gap adds up to a compelling investment opportunity. 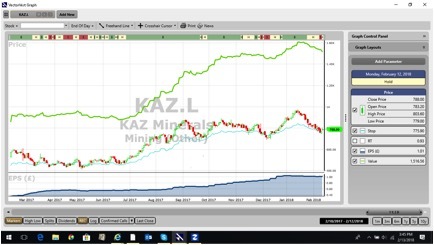 Buy KAZ Minerals #KAZ says VectorVest. Current valuation gap adds up to a compelling investment opportunity. By Alan Green in Uncategorized, VectorVest on 13th February 2018 . UK-based KAZ Minerals Plc (KAZ.L) is a high growth copper company focused on large scale, low cost, open pit mining in Kazakhstan. It operates the Bozshakol and Aktogay open pit copper mines in the Pavlodar and East Region of Kazakhstan, three underground mines and associated concentrators in the East Region of Kazakhstan and the Bozymchak copper-gold mine in Kyrgyzstan. In 2017, total copper production was 259 kt with by-products of 58 kt of zinc in concentrate, 179 koz of gold and 3,506 koz of silver. KAZ is listed on the London Stock Exchange, the Kazakhstan Stock Exchange and the Hong Kong Stock Exchange and employs around 13,000 people, principally in Kazakhstan. The pace of production growth at KAZ has been well documented by VectorVest metrics over the past year, plus I have discussed the investment opportunity on numerous Core Finance interviews. The GRT (Earnings Growth Rate) metric flagged up the potential in a year ago, when the shares were trading around 440p. Now at trading at 788p, KAZ still retains a forecasted GRT of 42%, which VectorVest considers to be excellent. Traders should note that the RS (Relative Safety) metric records a fair rating of 0.93 on a scale of 0.00 to 2.00, meaning the stock is not without risk, but regardless the stock remains considerably undervalued at 788p against a current VectorVest valuation of 1516p per share. The chart of KAZ.L is shown above in my normal format. The blue line study in the window below the price shows earnings per share (EPS) growing strongly over the last year. KAZ.L retreated with the recent worldwide selloff. Fibonacci analysts will notice that both the share and the copper price have found support at an important FIB level. Summary: VectorVest have always maintained the view that mining and resource stocks are for more adventurous investors, but in the case of KAZ the sheer size of the valuation gap (788p-1516p) marks the stock out as a compelling buy. This argument is also backed by steadily improving commodity prices, fuelled as ever by the relentless demand from emerging economies. Readers can examine trading opportunities on KAZ and a host of other similar stocks for a single payment of £5.95. This gives access to the VectorVest Risk Free 30-day trial, where members enjoy unlimited access to VectorVest UK & U.S., plus VectorVest University for on-demand strategies and training. Link here to view.